To position Signal with young families, we helped solve a problem parents all over the world experience – getting kids to brush at night. Our solution was simple; make the experience as fun and easy as watching a cartoon. Working with a team of Child Behaviouralists we designed our cartoon around scientific principles. There were 21 episodes in total, the number required to instigate behavior change. Within each, there were age-appropriate challenges kids completed to unlock rewards and the next episode. We designed hidden easter eggs into the story so families would re-watch episodes and reinforce the routine. In fact, every detail from the specific characters young kids find appealing, to the length of their attention span was carefully considered in order to make our story as effective as it is enjoyable. As a result, with a limited media spend we registered more than 200k active users within the first couple of months. 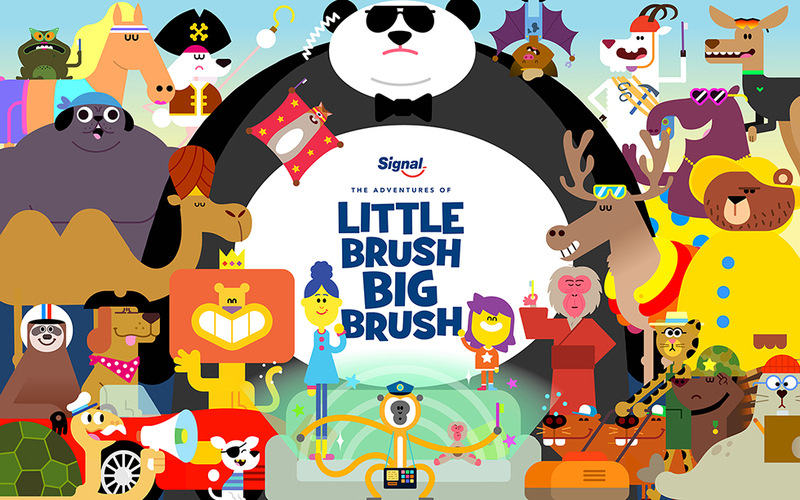 Meanwhile, schools around the world are picking up our idea with a Little Brush Big Brush curriculum scheme in development for an audience of 7 million children.